Leica J³autonomous delivers human-assist and autonomous technologies that increase safety, improve productivity, reduce performance variability and maintain consistent production results. 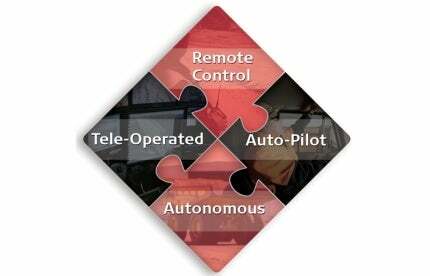 J³autonomous levels of autonomy include line-of-sight remote control, auto-pilot and tele-operated functionality. Leica Geosystems Mining offers an incremental approach to autonomy, ensuring that the autonomous functionality of your mine can grow with its changing needs. This provides operational benefits today, with a clear path to a fully-autonomous operation tomorrow. Leica J³truck has multiple levels of autonomous operation for all your hauling needs. These include reversing guidance, auto-steering, auto-spotting, auto-pilot and fully-autonomous. No matter the level of autonomous control you choose, this solution provides operational benefit today, with a clear path to fully-autonomous operation tomorrow. Leica J³dozer autonomous offers an incremental approach to mine autonomy for track and wheel dozers. J³dozer enables safety and provides productivity benefits for dozer operations, such as ripping, leveling, surge and stock piles and slot and production. Removing the operator from the high impact environment ensures safety is our number one priority.